With this title, we now have the last of the original greats, the final piece of the puzzle, and the last major character to be introduced for quite some time. The anthology books like Tales of Suspense and Tales to Astonish will provide new homes for the likes of the Hulk, Captain America, and the Sub-Mariner (before they're granted their own titles), while new characters like Captain Marvel will similarly have trial runs in upcoming showcase books like Marvel Super Heroes before graduating to titles of their own. In any case, very few characters or concepts created after Daredevil will hang on for any real length of time. Did the concentrated brilliance seen in Marvel's first couple of years really just amount to the right people working together at the right time? Did Marvel's success and all that it entails (licensing, meetings, expansion, more meetings, diversification, even more meetings) naturally lead to less hands-on work from Stan, in both the actual writing as well as the canny management of talent, putting the right artists on the projects most suited to them? Or was the later dimming nothing more than the fade of a fickle and fleeting muse? Regardless of the answer: Marvel's best years may be yet to come, but nearly all of their best characters have now been brought to life. Were I tempted to wrap up this blog, having begun at the start with Fantastic Four #1, this would certainly make an appropriate bookend. Fortunately, I've still some life in me yet...! exaggerated poses may not be to everyone's tastes, but I really like it! Young Matt Murdock gets an origin. Although many of these early Marvels are new to me, I had previously read (at least) the first issue of most of the major characters, and thus could have sworn I'd read this comic at some point in my past. Having now done so, I can't believe I ever did, or else the fact of it would surely have stuck with me. Because this comic is nothing short of STELLAR! 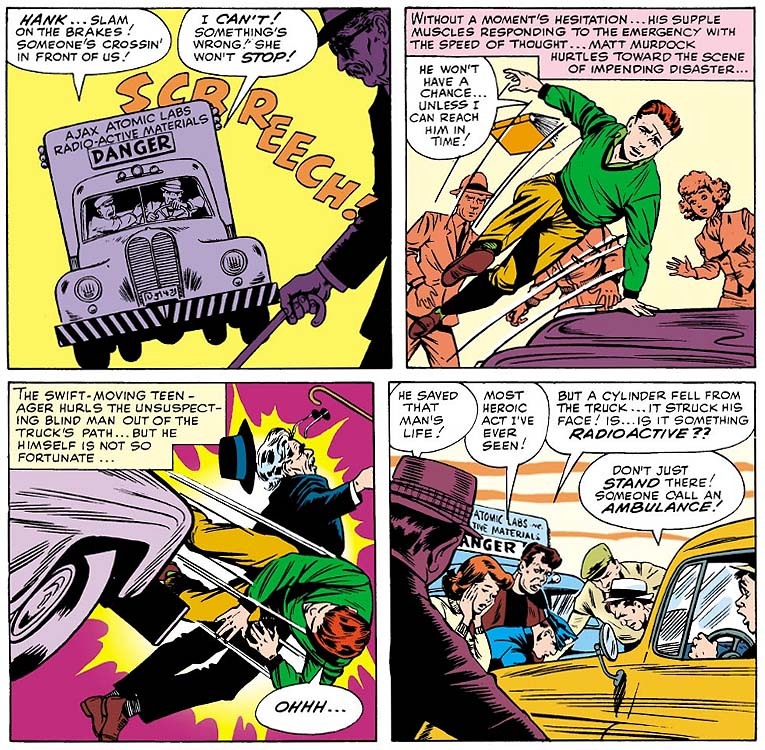 Bill Everett's art has an appealing scratchiness while also being incredibly detailed, and both his figures and panel compositions seem more akin to illustration work than comic art. Meanwhile, it seems that Stan is using every successful trick he's learned all in this one comic, as it features compelling characters, an exciting origin, surprisingly subtle foreshadowing (note how it's a blind man who young Matt Murdock pushes away from the oncoming truck), a myriad number of plot points, and a mature storytelling structure. This may be the most purely distilled example of the superhero formula since Spider-Man's origin; it may also be, out of 134 entries thus far, the most sophisticated comic I've read for this project BAR NONE. Honestly, if you've never had the chance to read this story - or are unsure, or can't recall if you ever have - then please take my advice here: DO IT! A superhero who is blind, and navigates by radar? Was Stan musing on what a "Bat-Man" might really be like? 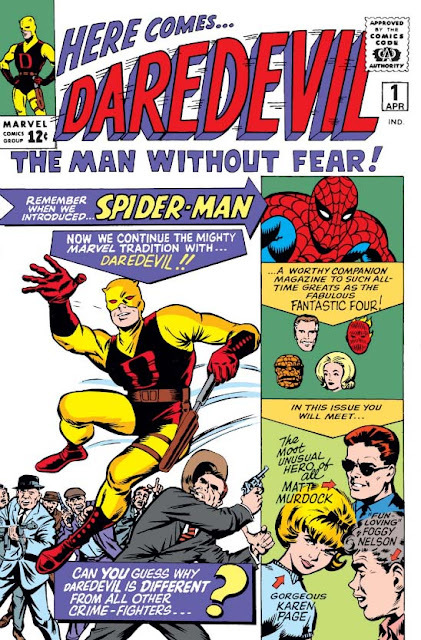 The modern reader may be surprised to learn, upon reading this early tale, just how fun a character Daredevil really is! As Brevoort points out in the above link, DD really was intended as "another Spider-Man". As a result, despite the tragic elements in his origin, he's here depicted as more a wisecracking and swashbuckling hero, instead of a broody and tortured one. That darker portrayal only really solidified during Frank Miller's seminal run on the title in the 1980s, and was such a massive success that it became the definitive version from then on. There have been some occasionally impressive followups - the underrated run by Ann Nocenti & John Romita Jr soon after, or the justly-lauded Bendis & Maleev epic of the past decade - but it also can't be denied that after thirty years of Daredevil as a dark character living a glum and dark life of dark darkness ... the routine has become a bit tired. So I'm looking forward to the new Daredevil series which begins in July, by Mark Waid (a modern writer with classic sensibilities) and Paolo Rivera, supposedly returning to its roots and bringing a real sense of superhero fun back to Daredevil's world - something that's long overdue, I think. There aren't a lot of modern comics I get excited about these days ... but with any luck, that could definitely be one of them. See, I like Daredevil comics UNTIL Miller came along and inserted ninjas and pissed on all the fun. So for me there are 30 years of Daredevil comics you can stick in a paper shredder for all I care. great review. I loved Bill Evertt as an artist and storyteller. I always noticed that the barrel of chemicals is never depicted in the art making me wonder if that was an intended part of the story or added during scripting. having fun reading your reviews from the beginning having just discovered your blog.